But Donald Trump can't stop topping himself, and Conway got called off the bench to defend the president's decision to fire FBI director James Comey, supposedly because of how he treated Hillary Clinton during the election. 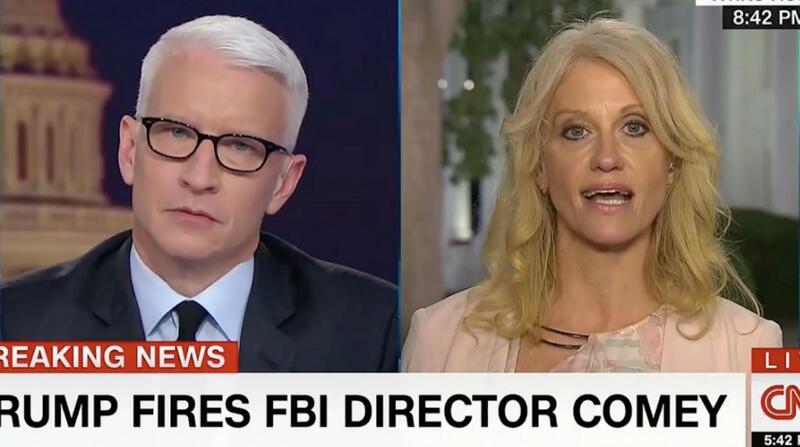 Anderson Cooper, our silver news fox, even presented Conway with clips of what Trump said about Comey and Hillary Clinton throughout his campaign. Many, many clips. Conway defends Trump by saying how "unkind" it is to bring up his past statements, and that we should disregard what he said as a candidate now that he is president. It's not clear why—Trump has basically done or tried to do everything he said he would do, from deporting immigrants to banning Muslims to destroying environmental protections. The only thing he hasn't done is "drain the swamp," perhaps because it would expose too many Russian alligators. “So now, your White House is saying what he did was wrong, but previously as a candidate, Donald Trump was saying it was the right thing,” Cooper responds. “You’re conflating two things that don’t belong together,” Conway says, adding, “Thanks for the trip down memory lane.” She then changes the topic to one of Trump's favorite talking points: winning in Michigan. Just came to Anderson Cooper's eye roll. An eye roll won't save the nation from disaster, but any sign that reporters will acknowledge Kellyanne Conway's nonsense is appreciated.